China's Nasdaq-like growth enterprises board, called ChiNext, was inaugurated in Shenzhen on Friday, opening a new channel for companies to raise capital. ChiNext, which opens trading on Oct 30, has already produced 82 IPO-generated tycoons, each worth at least 100 million yuan ($14.6 million) worth of stocks, says the prospectus of the 28 companies whose stocks will be traded on the opening day. Pu Zhongjie, president and general manager of Beijing-based LEPU Medical Device Inc, sits at the top of the "ChiNext wealth list", holding nearly 1.75 billion yuan worth of stocks. Pu owns more than 60 million LEPU shares, each of which is worth 29 yuan. Wang Zhongjun, president of Huayi Brothers Media Corporation, the only entertainment firm launching an IPO, is second on the ChiNext list. He holds stocks worth nearly 1.26 billion yuan. Director Feng Xiaogang holds about 2.88 million shares, or 2.3 percent of the company's stake. The issue price of a Huayi share is 28.58 yuan. 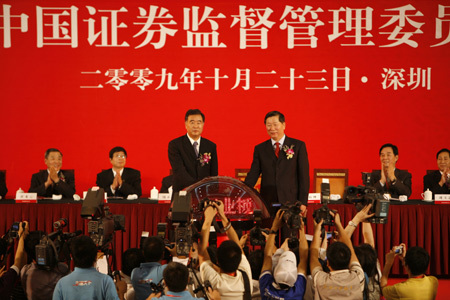 Wang Ning and Li Li, president and general manager of Beijing-based Ultrapower, hold 17 million company shares each. Both of them would be billionaires because one share is worth 58 yuan. The Shanghai Composite Index rose 1.85 percent to close at 3,107 points on Friday, defying fears that the launch of ChiNext may drain funds from the main board. The first 28 companies to trade on ChiNext have already raised a combined total of about 15.5 billion yuan, said Yao Gang, vice-chairman of China Securities Regulatory Commission (CSRC). On average, however, a ChiNext company has managed to raise only about 300-500 million yuan compared to more than 40 billion yuan each that China State Construction Engineering Co and Metallurgical Corporation of China attracted on the main board. The price earnings ratio of the 28 ChiNext firms is more than 56 times, with two of them even hitting 80, whereas it is just about 40 on the main board. 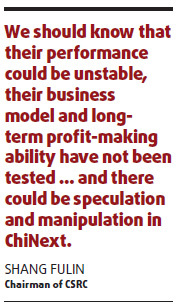 "Most of the ChiNext firms are in the high-growth period. 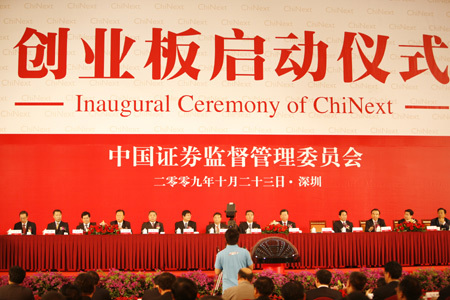 We should know that their performance could be unstable, their business model and long-term profit-making ability have not been tested and there could be speculation and manipulation in ChiNext," Shang Fulin, chairman of CSRC, warned, while speaking at the inaugural ceremony in Shenzhen. "Risk-control should be a priority in the ChiNext market," Shang said. China first made plans to launch a Nasdaq-style board for trading of start-up shares way back in August 1999. The plan was postponed in 2001 when the Internet bubble burst in the United States. But the global financial crisis quickened the pace of the ChiNext's launch. Since most of the newly issued loans - part of the country's $586-billion stimulus package - has flowed into large companies, most of which are State-owned, many small and medium-sized enterprises (SMEs), mainly privately owned, find it harder to survive without an alternative source of funds. "Access to finance is the most difficult growth problem SMEs face. But the government has been trying to find ways to help SMEs get funds in order to tackle the financial crisis," said Zhu Hongren, general engineer of the Ministry of Industry and Information Technology.